For over 30 years, Master Spas has been a leader in hot tub industry known for skillful marketing and high quality products. Recently, they 'wowed' the industry by teaming up with gold-medalist swimmer Michael Phelps to create a signature line of swim spas. The Michael Phelps Signature Swim Spas by Master Spas was designed with the input of Michael Phelps, his coach Bob Bowman and a team of Master Spas' experienced engineers. The Signature line of swim spas was built to provide the ideal solution for all fitness levels and health programs. The line features six new top-end swim spas for residential customers and one commercial-grade swim spa ideal for physical therapy centers, hospitals and fitness centers. 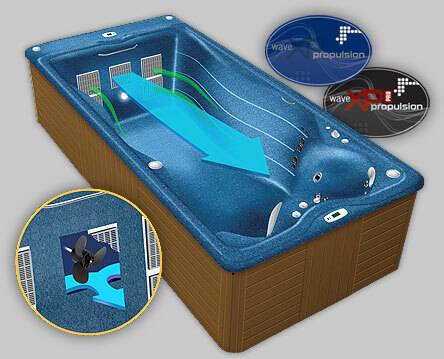 Their swim spas contain a trademarked technology called 'Wave Propulsion' which has been designed to create a wider, deeper and smoother current, ideal for swimming. The revolutionary shape of the Michael Phelps swim spa has been designed with the current in mind. The current is directed to go in just one direct, to provide the smoothest swimming experience possible. Michael Phelps Swim Spas are available with two types of current. Wave XP for normal swimmers and Wave XPO Pro, a 40% more powerful swim current for the elite swimmer. In January of 2014, Master Spas launched SNAPP (Swim Number App) a swim spa controller designed by Master Spas and Balboa controls. Using SNAPP, users can control the swim current, run workouts and watch training videos with their iPad. Dealer Network - Master Spas has one of the largest dealer networks in the world. Wherever you live, there is likely a Master Spa dealer nearby to help install and service your swim spa. 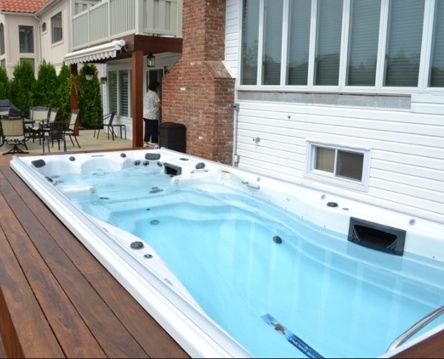 Product Finish - Master Spas has been making hot tubs for over 30 years. They know how to build a quality product that will last. They are also pretty good with the fit & finish and providing all the bells and whistles (i.e. built-in media, spa wands) that can go along with a swim spa. If you want to use your Swim Spa for both swimming and relaxation, then the Michael Phelps Swim Spa may be the best choice. All Michael Phelps Swim Spas are 94" wide. Regular swim spas are 51" deep. Deep swim spas are 60" deep.